Word-of-mouth marketing has always been an impactful form of promotion. But now that people have an influential voice online; word-of-mouth now reaches more people through social media, making it more powerful than ever. Let’s look at the facts. According to Nielsen, 92% of consumers trust recommendations from friends and family over all other forms of marketing. If you want to win the marketing race in 2016, you need to be thinking about word-of-mouth marketing. Here at Popdeem, we have five simple tips to show you how to create word-of-mouth in 2016. Most companies tend to prioritize their efforts and investments into product promotion, and potentially neglect customer service. Yet this is the catalyst for creating positive word-of-mouth. Are you providing an above average experience/service and customer support? Until the answer is yes; you still have work to do before you can expect positive word-of-mouth marketing results. People rarely talk about an average experience, but often people talk about how positive or how negative the service was. Do that little bit extra for your customer to get them excited about your business. In addition to word-of-mouth, customer loyalty is also driven by positive experiences with your brand. 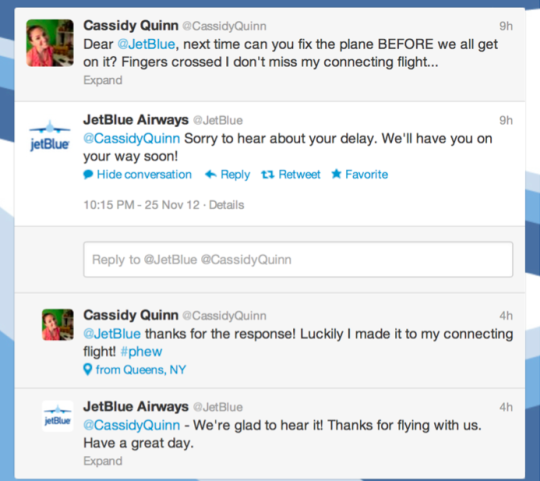 Below is an example of one of JetBlue Airways’ quick responses to a customer query on Twitter. Making the customer feel important to the brand. One of the new phenomena caused by social networks is that they can make everyone an influencer. Meaning that a portion of your customers are likely to be influential, making them ideal customers to generate word of mouth marketing for your brand. People trust a brand recommended or talked about, by a friend or peer, more than brands they see in ads. So take some time to connect with the influential people in your customer base. If you can connect with the right influencers, and have them reflect their positive experience with your brand, their word of mouth has the potential to be extremely impactful and reach a significant number of people. 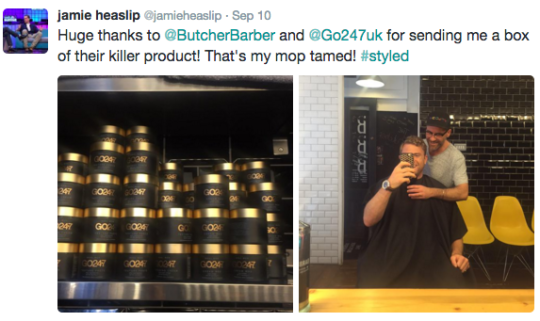 Here is a great example showing how The Butcher Barber connected and engaged with an influential customer, international rugby player, Jamie Heaslip, to create word-of-mouth and raise awareness of their brand. The Irish and Leinster rugby player is very influential on Twitter, with frequent and engaging updates to his quarter of a million followers. Here’s the tweet he shared, promoting @ButcherBarber. Be loyal to the customers that are loyal to you. Take note of those customers who consistently purchase from your business, refer friends to you, or give positive reviews about your product or service. Services like Popdeem are all about turning customers into brand advocates with rewards. Rewarding customer loyalty is an activity that goes a long way. Create an experience for loyal customers by giving them opportunities to feel special or important through special offers, exclusive content access, etc. This will help create a personal connection with customers; naturally, making them more likely to share positive word-of-mouth and become a brand advocate. Positive word-of-mouth tweets from Hilton customers enjoying their HHonors perks. As we have mentioned in previous tips, it’s very important to connect with your customers. The more intimate customers feel with brands, the more likely they are to promote or defend a brand to their friends and family. The best way to achieve this is by humanizing your brand online; make your followers feel like they are interacting with a brand with personality. Respond to any mentions your company receives on social media, be it a positive or negative mention. Lightening the mood with humor is recommended, where appropriate. Give customers an insight into what’s happening behind the scenes. Posting pictures of “Coming Soon” products will build excitement. By giving followers a view into your day-to-day operations makes your brand, and the staff behind it, more real and relatable. Include their positive reviews and posts on your website and/or on your branded social media accounts. This makes customers feel included and that they’re adding value to the company. An example of a light-hearted engagement between Cadbury’s and one of their customers. After you have put in all the hard work of creating a great customer experience and building a loyal customer base; the next step is to motivate these customers to share their experiences via word-of-mouth. Give consumers different ways to talk and share, whether it’s on Yelp or TripAdvisor, Facebook or FourSquare. Let them know that sharing their opinion is important to you. Social rewards are a simple way to encourage your customers to share word-of-mouth. By creating incentives like, rewards for check-ins or tweets, is a great way to give the everyday customer the little push they need, to talk about your brand online. At Popdeem, we have a social rewards platform that allows brands, with a mobile app, to reward their customers for sharing their in-store experiences on social networks. We work with brands all over the world to help them turn their loyal customers, into brand advocates. Screenshots of Headspace’s Popdeem enabled social loyalty app. Now that you are prepped with these five simple tips to help you kick start your word-of-mouth marketing, it’s time to integrate them into your own business. Don’t sit back and hope conversations happen organically, build these techniques into your marketing plan. If you’re in the market for a social engagement tool that makes it easy for you to reward your customers for their word-of-mouth on social media – please visit https://popdeem.com/.